Gypsies are members of a people that arrived in Europe in migrations from northern India around the 14th century and now live on all continents. As they traveled across Europe, they brought with them music, dance, artistry, crafts and language which has become part of our everyday use and integral to our culture. Many Gypsy groups have preserved elements of their traditional culture, including an itinerant existence and the Romany language. 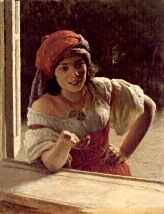 Gypsies have been part of our society for many hundreds of years. They were originally believed to be Egyptians, which is where the name 'Gypsy' comes from. The idea that they came from Egypt was probably due to their dark complexion, exotic and colourful clothing and the fact that many groups arrived in Europe from the Middle East and the Eastern Mediterranean. Usually in the form of belly dancers, fortune tellers, readers, and acrobats, these exotic buskers enjoy giving top performance as they entertain around the globe. With their romantic nomadic way of life, gypsies still very much exist today as professional entertainers in busking, stage, and circus performances.